Product code: ES3869 Categories: Sold Items, Sold Rings. 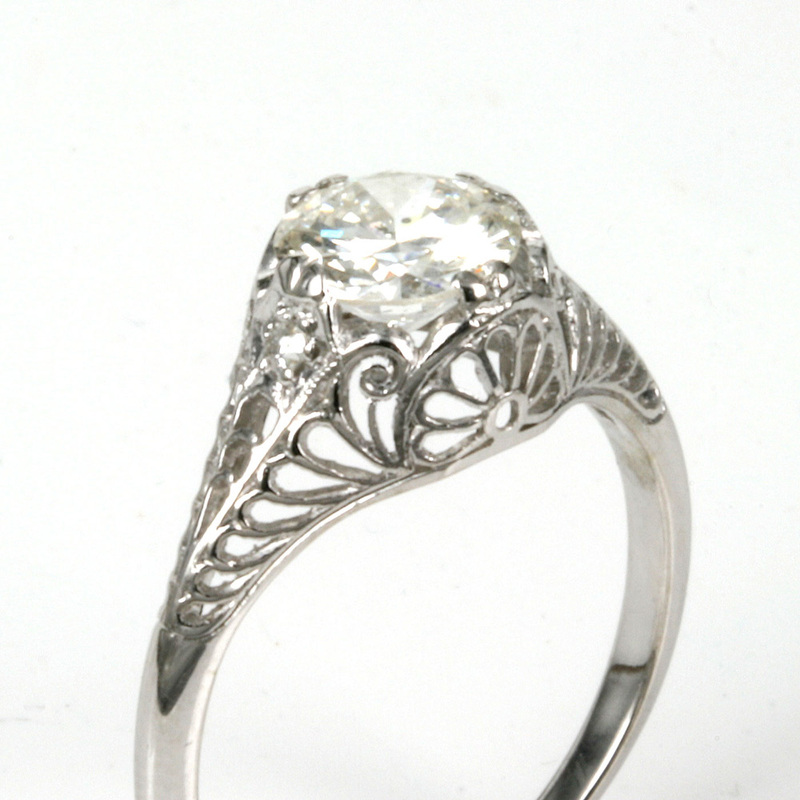 What could be more romantic than wearing an Art Deco diamond engagement ring on your finger? 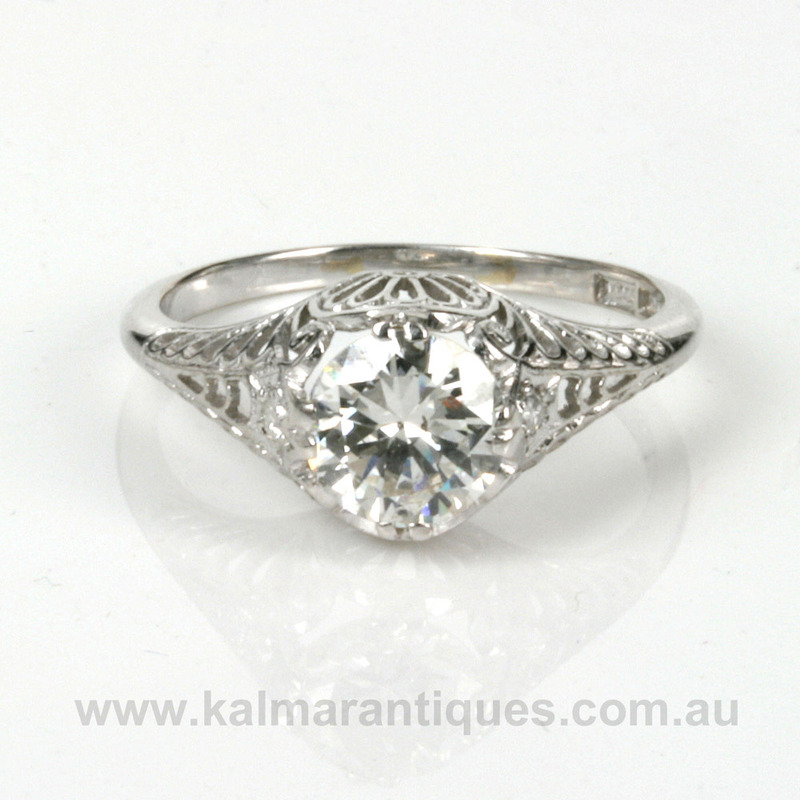 And here is a truly stunning Art Deco diamond engagement ring that is so elegant and displays so much attention to detail in the most wonderful way. Made in 18ct white gold around 1925, this diamond engagement ring is set with a 1.10 carat diamond in the centre that sparkles magnificently and is set amongst the most incredible and intricate detail. Even on each side on the ring set amongst the filigree is one more diamond each side to add that extra degree of elegance and style. The centre diamond is H in colour and P1 in clarity and the two smaller diamonds total 0.01 carats. The sparkle from this diamond is amazing and combined with the most incredible setting all go to make this such a unique and incredible engagement ring. From left to right all across the top to where the band curves down each side, this distance measures 18.1mm across by 8.7mm wide at the centre. There really is not one angle that you could look at this ring and not be impressed by the detail and on the finger it looks even more incredible. This is such an elegant and highly detailed Art Deco diamond engagement ring that sparkles magnificently and will always be loved and admired.